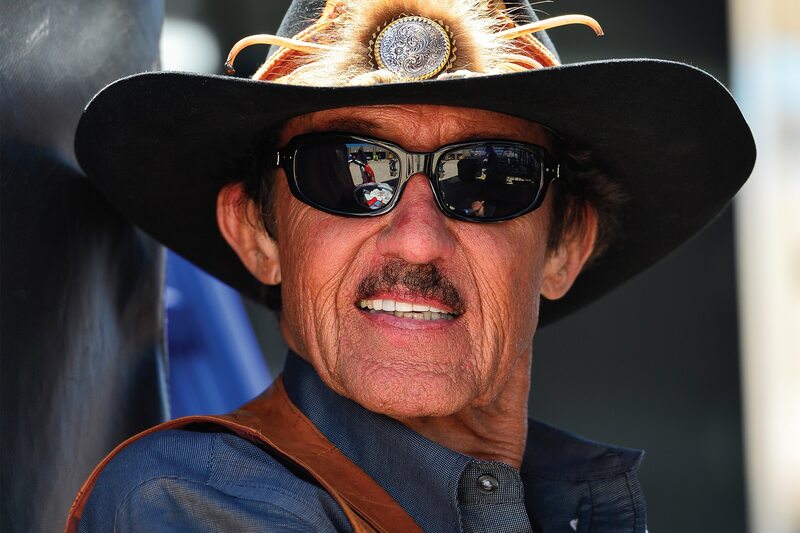 With his Nashville-style cowboy hat, wraparound sunglasses, rodeo-size belt buckle, and cowboy boots, Richard Petty is the most familiar face in NASCAR stock-car racing. And much appreciated — he gives his famously arabesque signature to autograph seekers just as patiently now as he did in his days as one of the world’s best racers. Between 1958 and 1992, Petty won 200 races and seven NASCAR championships, and even modern drivers still call him the king. We spoke with him at the Petersen Automotive Museum in Los Angeles during an event that not only awarded him the Robert E. Petersen Lifetime Achievement Award but that also celebrated his upcoming 80th birthday. Automobile Magazine: Talking to you is like going back in time. What was it like for you in the beginning? RP: My daddy Lee Petty drove the first NASCAR race back in 1949, and all of us kids would be crawling under his car and working on it. In our little town of Level Cross, North Carolina, everybody had a barn. Most people were tobacco farmers, so they had a tractor in the barn. We had a car in our barn. AM: As high tech as NASCAR race cars are today, we forget how basic the “strictly stock” racers were then. RP: When I drove my first NASCAR Grand National race in 1958, I was sitting on a plain bench seat and holding the stock steering wheel. I wore a crash helmet, white T-shirt, some jeans, and black, ankle-high engineer boots. When we ran the super speedways, we’d jam a 2-by-4-inch piece of lumber under the upholstery next to my right hip as a brace. It wasn’t until the mid-1960s that we started using bucket seats out of vans. AM: Driving those big stockers doesn’t sound so pleasant. RP: I’d get so hot that the crew would give me a wet rag to chew on, sometimes just a red shop rag that was laying there. And now we all realize just how bad the carbon monoxide was. I collapsed because of it at Atlanta in 1963. It was the carbon monoxide that ended my driving career as much as anything. AM: You scored 200 wins from 1,184 starts. How did you do it? RP: I wasn’t the fastest driver, but I knew how to race — when to save the car and when to get on the gas — and always to get to the finish. And because it was our livelihood, we made it to all the races on the schedule, and not everybody did that in the beginning. AM: It sounds like a lot of work when you had only a handful of guys, not dozens like today’s teams. RP: It was a lot of work towing the car around the South when there weren’t any interstates. But, you know, we were a family team. My cousin Dale Inman was the best crew chief in racing. My brother, Maurice, was the best engine builder. We were the first team to really work on our cars — sort of redneck engineering, you’d call it. Now everybody talks about a team getting on the same page, but it was nothing new to us. We’d be working on the car in the barn, and then my mama would call us into the house for dinner, and then afterwards we’d go back out to the barn and keep working on the car. We were family. AM: What was it like to go from a 4,000-pound stock car to the little Porsche 911 you drove in the 1973 International Race of Champions series? RP: Before then I’d never even sat in a rear-engine car. Not even a Volkswagen Beetle. AM: Here at the Petersen Automotive Museum we see some of most beautiful and desirable cars in automotive history. Do you own any collectible cars? RP: Well, we have the Richard Petty Museum in Level Cross, North Carolina, and Petty’s Garage in Randleman can build you a custom Ford Mustang. Last year Smithfield Foods, a sponsor of Petty Motorsports, commissioned Petty’s Garage to build a tribute to my 1967 Plymouth Belvedere Hemi to give away in a sweepstakes, and this year we’re building a tribute to my 1970 Plymouth Superbird. But I don’t own any old car myself. I guess as a racer I never thought about what last weekend’s car was like. Instead I was thinking about how much better next weekend’s car would be.